My phase II is not as complicated as Sahara's, I know where I will be isolating, and I will be manually changing the point (certainly in the short term), and for ease of operation I was considering SPDT/DPDT switches close to the point, the switches will need to be discreet and waterproof. Question is where is the best place to buy these, and thoughts on mounting the switches - please! RS, Farnells or Rapid Electronics would be your best bet. After working all morning installing the insulated rail joiners I managed to wire the switch incorrectly! I have taken the wires from the middle of the switch and connected them to the main controller wires; whereas these two wires need to go to my station. It is the outer four wires of the DPDT which go to the continuous circuit rails, isn't it? I have to make certain they are the correct way round. Thank you Gizzy. I was just viewing the article on switches and your drawing makes it quite clear. Others have posted lots of information but somehow it won't go into my thick head and stay there. I've given up for the moment as I have an appointment with my counsellor later and I have to prepare for it. I'll try and get back to the opportunity tomorrow morning. In this instance, it doesn't matter which of the two pairs of wires is 'in' and 'out'.. It just means one way reverses the supply coming in (to the switch), and the other the supply going out. As you are only ever switching one of these it still reverses polarity across the switched contacts. It doesn't matter whereabouts in my station I put the red wires? And the blue wires can go anywhere on my main line circuit. So I don't need to use all the switch contacts? 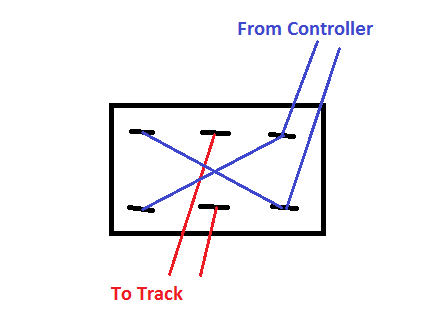 Just take two of the outside contacts and connect them to my controller/main line track? the shorter the wires the better in terms of connecting to the main. so somewhere near the "middle"